Acción Cultural Española e Instituto Cervantes. 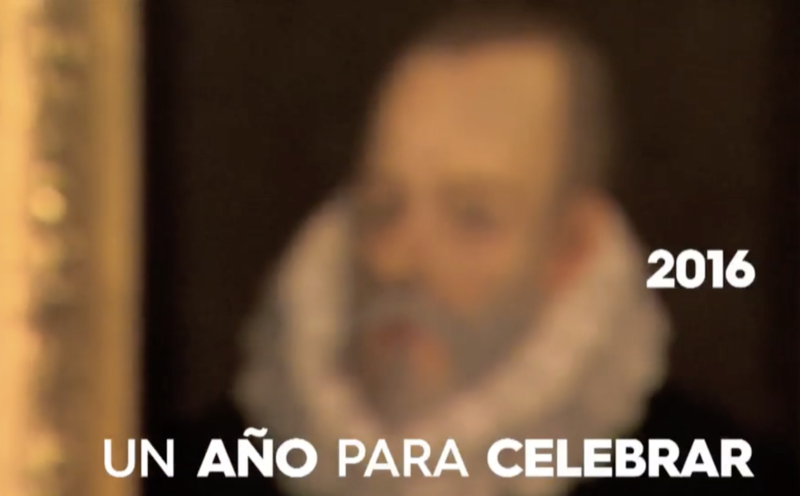 Where and when was Cervantes born? For centuries this was a double mystery. The first was solved after his christening certificate, dated 9th of October 1547, was found in the parish of Santa María la Mayor in Alcalá de Henares. As for the exact date, we can only assume that it was the 29th of September, the day of San Miguel (Saint Michael). Quivering in the court. Queen Elizabeth of Valois, the third wife of Philip II, dies after giving birth to a child who will also die. A shiver runs through Madrid, and the young Cervantes, encouraged by the grammar teacher Juan López de Hoyos, writes poems that will be published the following year in A Story and Relationship of the illness, death and funeral of the Queen. Cervantes seeks his fortune in Rome among the dignitaries and popes. He works as a waiter in Monsignor Acquaviva’s retinue, a figure who later goes on to wear the purple robes of the cardinal. When his stint at the palace is over, Cervantes joins Diego de Urbina’s company as a soldier. He traverses Italy and it traverses him. Cervantes’ fate is entangled with the story of the day of the Battle of Lepanto that pits the Holy League against the Ottoman fleet. On the bloody foam of the sea, amid the chaos of arquebuses, ships on fire, mutilated bodies and the terrifying sound of fifes, Cervantes is wounded in the chest and looses the use of his left hand. The horrendous battle results in uncertainty and throngs of people at the hospital in Messina, Sicily, where Cervantes recovers from his injuries. Sicily is under Spanish rule at that time, and is home to the winter quarters for Don Juan of Austria’s fleet. Meanwhile, Cervantes survives and within a few months is back in the military. In between military campaigns in the Mediterranean and his billets, Cervantes interspersed his soldier’s duties with a disorderly existence, turbulent love life and evenings at the tavern. Of all the cities in Italy, it was Naples – the capital of the Spanish-ruled part of the country – which, in the words of licenciado Vidriera, was “the best in Europe, and even in the whole world”. Recollections of the city remained with Cervantes forever as an indelible memory of his wonderful youth. The Mediterranean, infested with pirates, is a sea at war. In Naples, Cervantes embarks on a ship bound for Spain but, in the Gulf of Roses, his schooner is boarded by the corsair Arnaute Mamí’s men. Cervantes ends up in Algiers, the bustling base of the Barbary pirates and a large slave market. It would take five years, and four failed escape attempts, to regain his freedom. The former captive landed in Denia, finally finding himself on Spanish soil. He then went to Valencia, where he took part in a procession to offer thanks and where he spent his first weeks of freedom. Eleven years had gone by since he left Spain and a lot had happened in many places: Tunisia had been lost and recovered, Juan de Austria died, Philip III was born, Portugal was annexed and the court made its home in Lisbon. Spain was continuing to expand its world: Legazpi founded the city of Manila, Mendaña reached the Solomon Islands. And Cervantes began to dream of America. An official assignment – about which little or nothing is known – and the mysterious veil of this Spanish-ruled place in North Africa turn this journey to Oran – in May and June 1581 – into another mystery that surrounds Cervantes’ life. Involving diplomacy, espionage or work of an administrative kind, the only evidence of it is that, on his return, he was paid fifty ducats. Cervantes travelled to Lisbon lured by the scent of new opportunities, but these amounted to nothing. The new court, suddenly overflowing with go-getters and people hoping to find something to do, was seething with commercial activity: “In her the riches of the East are poured out, from her they are scattered over the universe.” The author blew the dust off the memories of this fruitless stay and used them in Persiles. Cervantes surrenders to amorous pursuits. Having just had a daughter with Ana Franca – the wife of a tavern owner – he then travels to Esquivias, Toledo, to help the widow of a poet friend to posthumously publish a songbook. Once there, he marries Catalina Palacios Salazar, a woman half his age. He sells the rights to La Galatea, which is published the following year. In time everything is achieved, even the dull position as collector of supplies in Seville. But back then Seville was like a cosmos, a foretaste of the Indies, where of all its wealth and splendour arrive. He does not stop writing, and pens poems and plays while calamities – debt, charges against him, and even excommunication – rain down on him. The life of a collector is not particularly easy. 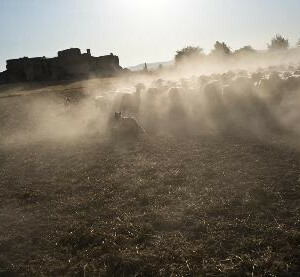 Cervantes is accused of selling wheat without authorisation and spends a few days under arrest in Castro del Río. Some scholars believe that is was here where the idea for Don Quixote came to light; others maintain it happened later, when he was imprisoned again in Seville. The Cervantes family – made up of his wife, sisters, daughter and niece – follow the court all the way to Valladolid, settling in lodgings above a tavern, very close to the town’s abattoir, in a small building housing many people. In this stressful environment, Cervantes finishes the first part of Don Quixote. Six hundred and sixty four pages and many typos. From Juan de la Cuesta’s printing press on Atocha Street in Madrid, the novel that changed novels forever was born. The bookseller Francisco de Robles, owner of the rights, sells each copy for two hundred and fifty maravedis. The book soon sells out and reprints are published at once, some of them illegally. The novel, long or short, was always there within Cervantes, who makes the Italian novella his own, in other words, Spanish. It seems that there are to be twelve Exemplary Novels, either because there are two in one – The Dialogue of the Dogs is part of The Deceitful Marriage – or because for years The Pretended Aunt was included in that number, although today this opinion has been rejected. Alonso Fernández de Avellaneda – a pseudonym that is still something of a puzzle – publishes, in Tarragona, a spurious sequel to Don Quixote. The ruse spurs Cervantes to finish the second part of Don Quixote, and he enriches the plot by adding an element of metafiction to the discourse of the novel which is published a year later in Madrid. Publishes Journey to Parnassus and Eight Comedies and Eight New Interludes, Never before Performed. In mid April, the writer begins to feel death approaching, the hand of which can be felt at his home on León Street, on the corner with Francos Street (today Cervantes Street). He receives the last rites, writes the dedication for Persiles and, three days later, on the 22nd of April, dies. The following day he is buried in the convent of the Discalced Trinitarians.